I wasn't really a fan of this one. I like the idea of trying to find ways to fill your life with more happiness, I'm just not one who likes to quantify things, especially something as philosophical as happiness. I don't prefer charts and graphs and lists of strategies. I found Rubin's method incredibly exhausting and all I kept thinking about was how unhappy her method would make me if I attempted to carry it out. I do think that seeking happiness does involve some strategy, I just think Rubin's means of seeking it out was not the way I would go about it. Don't get me wrong, I think her intentions were good and I admire her attempts, I just found myself having to skip entire sections because her method for going about seeking happiness felt so mundane to me. 1) Trying to find happiness in the mundane. 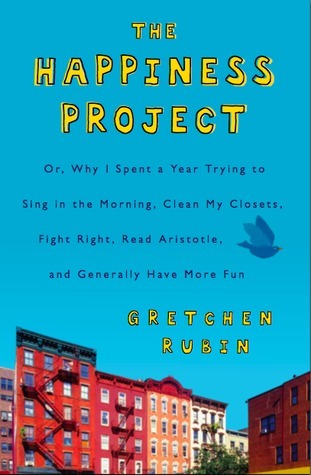 Rather than doing something drastic a la Elizabeth Gilbert and travel the world, Rubin testifies that happiness is in our everyday moments. 2) The attempt to find ways to be more happy was not just for selfish reasons, but also so that she would be more prepared when that bad news wakes her from her sleep one night at 3 a.m.